This past Sunday, I went for what I knew would be my final walk of the weekend, because the sun would be setting, it would be dark, and another work week would be starting. When I left for my walk, Hubs headed down the road to check on the cattle for the last time that day. It was fairly cold, and there wasn't much to photograph, as my critters are very few and far between. So, when Hubs was passing by on his return back to our home, I jumped in the vehicle and said "Take me for a ride to look for deer, please." So... we went for a drive. However, we didn't see any deer, which is weird because I see deer EVERY.SINGLE.EVENING when I'm driving home from work. 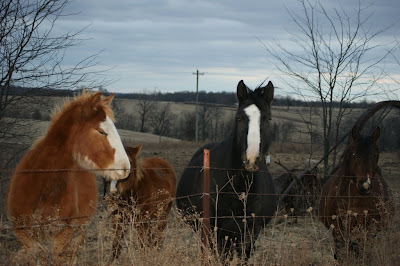 I did, however, meet a few new friends, and they are the stars of my Camera-Critters for this week. You'll have to excuse the eyes - it was nearly dark, so I had to use the flash, and I haven't had a chance to alter/correct the photos. I have some bald eagle photos up for Camera Critters this week. Hey, Misty Dawn. These photos are beautiful. 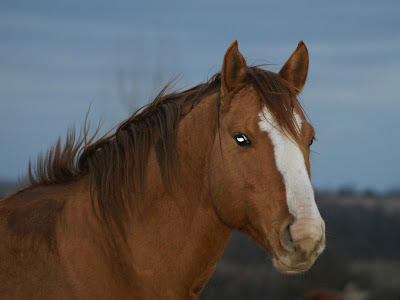 Horses are such gorgeous creatures! I've got my post ready, but the meme still says Jan 17. I'll check back in a bit so I post my link on the right page. Have a great day! I love horses. They're so beautiful! Love your new friends. Love the photos! Love horses! Horses are a favourite of mine! I love the photos of your beautiful friends! They look like they are saying "Hey, are you the food lady?" Great pictures. I got my first post up, I love this meme, right up my alley! Misty: Those were neat horse captures. I like the sparkle in the first ones eye. The pony on the left is my favorite! Beautiful horses Misty. They are just like big dogs aren't they? wow! pretty horses! love the brown so much so adorable. Check out my entry here and thanks. What a nice place to walk. The horses are pretty. I do love wild horses. Gorgeous cuties. Misty, your friends are absolutely gorgeous! Do I like horses? NEIGH... just kidding, I love them! Shame about the deer - but the ride was worth it as you meet these fine creatures! They certainly look well cared for. The way their manes are blowing make it look so cold. I always have liked horses...I would like a better look at the one looking straight at the camera in the bottom photo. Beautiful horses! Thanks for the great pics. I have joined up for the first time today. The new friends you made sure are pretty.Your welcome for giving you the idea to spend more quality time with your hubby.I don't think any of really do that as much as we should.